Raffle Factory is a full Lottery/Raffle Extension for Joomla - you can build a turnkey site similar to rafflecreator.com in just a few clicks. Using Joomla as the content management system, our extension can work with any available template and in any type of hosting. 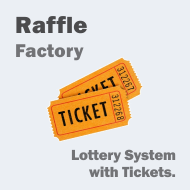 You can test Raffle Factory by clicking the menu on the left (log in as any of the three users), and check out the administrative backend by clicking on the menu on top. Even webmasters without any PHP knowledge can configure the extension's appearance, easily using the integrated templating system. There is no need for the webmaster to change the extension's code, thus ensuring a 100% upward compatibility with our future releases. The Extension Package you get will include ALL PHP SOURCES (nothing encrypted) along with the full documentation. Setting up a turnkey Raffle Website has never been easier. Organize your own raffles on your website, or allow others to come and post raffles and charge a comission for every ticket sold. Tickets can be sold at any price with limited or no costs related to the actual raffling process, compared to real life raffles or lotteries. The tickets can be randomly chosen by the script or the raffler can pick the winning ticket from a list. If chosen manually, no details are shown related to the ticket other than the number until the raffle closes, to prevent fraud. The Raffle owner can set a price for each ticket, set a number of available tickets and also a ticket limit for each user.Using a Reserve Price (optional), the Raffle poster can choose to have a minimum amount of tickets sold in order to validate the raffle. This ensures that you avoid making losses on expensive products like Cars or Technology Gadgets. Public Raffle - Buyers and number of tickets sold are visible to all other users. Private Raffle - Raffle is visible, but details about tickets sold are hidden to other users. Dynamic titles. All Raffle detail pages have a dedicated unique title. Improves relevance a lot.